Global Parliament and the Global Community welcome Ban Ki-moon just sworn in as Secretary-General of the United Nations. To work diligently toward the building of sustainable global communities, we are now researching and developing goals and objectives of the Global Civilization. DR. Michael Ellis has offered to participate in this quest of a better future for humanity and all life on Earth. He is now part of our group as the Minister for Sustainable Civilisation, Peace and Disarmament. All members of the Executive Council of Global Ministers participate in this endeavor. Certainly we want the participation of everyone on Earth. To make that possible we are organizing Global Dialogue 2007, a process allowing everyone's participation. 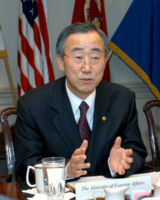 The Global Community would also appreciate your participation, and that of the United Nations.